A rail enthusiast and his wife tackled a butter knife-wielding burglar who tried to steal a prized collection of model trains, a court heard. John Headington, 85, and his 57-year-old wife Susan sat on Robert Barnes to restrain him after the break-in. Lincoln Crown Court heard Barnes used a brick to smash his way into the house while the couple slept on 20 November. Barnes, 28, admitted burglary and possession of a bladed article and was jailed for two years and four months. The court heard Mrs Headington was woken by the sound of Barnes, of no fixed address, breaking in through the kitchen door of the Lincolnshire home. Andrew Scott, prosecuting, said she saw a light on in an upstairs room where her husband kept his model railway collection and decided to ring the police. Former railway worker Mr Headington, who has had two hip replacements, managed to get Barnes in a bear hug as he emerged from the room carrying some of his most valuable model trains. Mr Scott said: “Barnes barged past Mr Headington who fell backwards against the landing wall. “As Barnes continued down the stairs he ripped the phone from Mrs Headington but then fell down and rolled on to the floor. Judge Simon Hirst described the couple’s bravery as “remarkable”, while the court heard Barnes had no memory of events after drinking heavily. 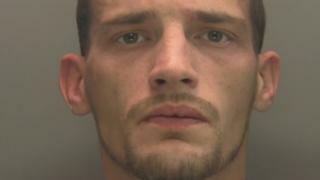 The judge said Barnes “took highly sentimental items and damaged them beyond repair”, and condemned him for “barging past an 85-year-old man”.